When I saw the infinity mirror effect for the first time, I was impressed with it. I wanted to build my own version of it, and so, I decided to use Infineon's 3D magnetic sensor kit with the rotator knob to control colors on an infinity mirror with an RGB LED strip. Note: The infinity effect is not visible that much; due to the camera and also I need to experiment with the placement of the mirrors to make it more pronounced. My inspiration for this project is techydiy's infinity mirror here. Have a look at it to understand the concept of the infinity mirror. Because the 3D Magnetic 2Go kit doesn't have enough PWM pins, I used the Arduino MKR1000 board along with that so that I could easily add anything else to the infinity mirror. Other than that, the color changing algorithm works by converting the RGB values (from 0 to 255) to HSV (Hue Saturation Value) where changing the value of hue from 0 to 360 will change the color of the LED. Note: I didn't write the code for this conversion from HSVtoRGB. After searching online, I found the code from this website here. Therefore, I used the algorithm modified it to work with the 3D Magnetic 2Go kit. The 3D Magnetic 2Go sends the knob's current position from 0 to 360 degrees through its hardware serial port. The MKR1000 is connected to the 3D Magnetic 2Go's UART pins, and it parses the angle sent earlier. This angle is used in the code snippet showed above in place of hue (which as I said before ranges from 0 to 360). This function generates three values (red, green and blue) each ranging from 0 to 255, based on that angle. Using analogWrite on these values to the RGB LED strip connected to the MKR1000 (using transistors like TIP120, of course!) allows you to make the light change color to the brightest colors on the color wheel, just by rotating the knob, resulting in a beautiful effect. That being said, let's move on to the project itself. Note: I will be using the Arduino IDE to program the kit (version 1.1.2). Assuming you know the basics like how to upload code and have already set-up the kit to receive sketches from the Arduino IDE, this step will be very easy. Simply download the attached code for the XMC1100. If you do, it means everything is okay, upload the same code again, but this time, set "Serial Output Selection" to "On Board", and make sure it is uploaded properly. Now you won't see any output in the Serial Monitor, this is perfectly okay, just move on to the next step. Download the attached code for the Arduino MKR1000 and simply upload it to the Arduino MKR1000. That was easy, wasn't it? Now, just connect the Tx pin of one board to the Rx pin of the other, and the Rx pin of one board to the Tx of the other, and connect the 3.3v supply from the MKR1000 to the 3.3v pin on the XMC2Go (if you want! ), and make sure the grounds are connected too. Note: I would recommend that you first build all of the electronics part, and when it works perfectly, then move on tobuilding the infinity mirror itself. This is the angle from the knob converted to RGB values. Again, rotating the knob will change these. 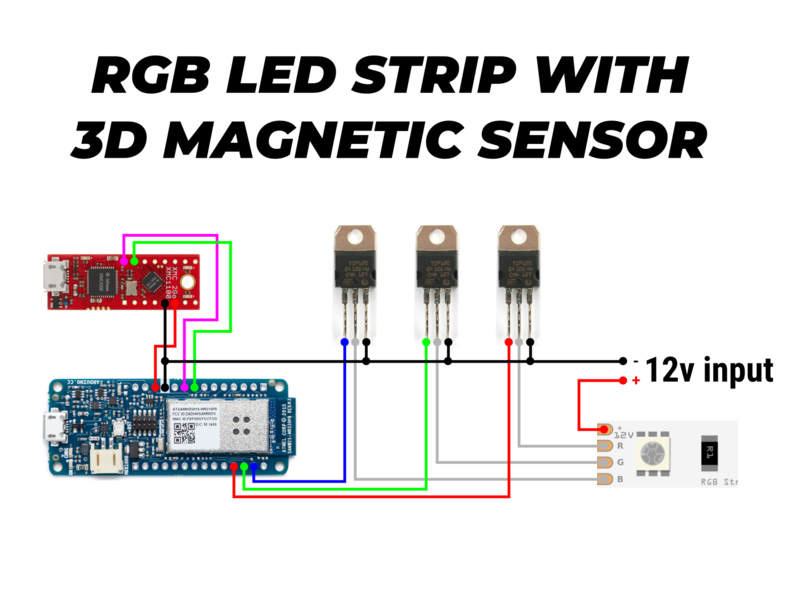 What is happening is that the 3D Magnetic Sensor kit is sending the angle the knob is on (from 0 to 360 degrees), and the MKR1000 parses that angle and converts it into the RGB color codes (from 0 to 255 each), looping through all colors. Rotate the knob and see the values change. Note: I am using the common anode type RGB LED strip, and this article on Adafruit was very helpful on setting it up. Now that you are done with the electronics and are able to change the color on the RGB LED strip, we move on to making the infinity mirror itself. I won't be going into much detail on this because I'm no expert; it was my first time making something like this, but still the end result wasn't that bad. Again, I saw this video on YouTube, and it really helped me in building it. These are a few images of how I built it, just to make you understand the concept. I applied this car window tint (which I got from an auto shop) to the glass using soapy water and a card for pressing out the bubbles. So now you are able to change the color of an RGB LED strip using the rotator knob and Arduino MKR1000. You can easily alter the code in the XMC2Go to change another RGB LED's color but when the switch is pressed, and you could add a lot more too. You could even the same rotator knob to dim or brighten another LED, with simple changes in the code. I couldn't find an RGB LED strip which has multicolor LEDs; the one I found has separate red, green and blue LEDs. Using an RGB LED Strip with multicolor LEDs would give a much more pronounced color change, so if you find those, they would look even better. Make sure to comment with your ideas and opinions about the project. Upload the codes to the 3D Magnetic sensor kit and the MKR1000, and connect everything according to this diagram.